Yesterday was an absolute roller coaster of emotions, with the seven stages of grief taking place just minutes before unbridled joy. The vindication and satisfaction felt by Chelsea fans, so closely juxtaposed by the Barcelona faithful that will see their legendary squad finish the season without a trophy (The Club World Cup doesn’t count). The pre-match nervousness was replaced with excitement as just after kickoff, Chelsea had an opportunity when Ashley Cole broke down the left side and almost found Ramires with a pass, but Victor Valdes pounced on the opportunity and Barcelona settled into possession. The following minutes were filled with half chances to Barcelona, with a ball running just long of Alexis Sanchez, a block from Terry, another block from Cahill, and then disaster struck. After his block, Gary Cahill stayed down on the ground after it appeared he had strained hamstring while stretching for the ball. Barcelona fans immediately started jeering the Chelsea defender for time wasting, but Jose Bosingwa immediately began warming up, signaling to those watching that this was more than just a time wasting tactic. Cahill soldiered on for a minute or two before Andreas Iniesta carved open the Chelsea defense and lofted a ball towards goal that was cleared away from danger by Ashley Cole. 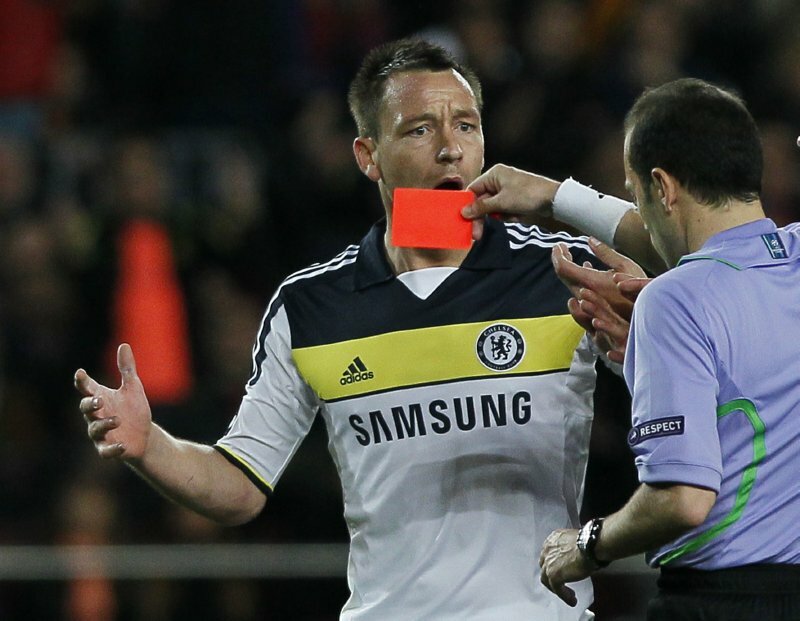 Cahill continued to struggle and in the 12th minute he was taken off for Jose Bosingwa. After Cahill’s substitution, Chelsea began to settle into defense, manning the ramparts while the Barcelona hordes sent wave after wave of attack at their gates. Chelsea for most of these periods had eight or nine men behind the ball while Barcelona relentlessly attempted to play one-two passes into the box. Barcelona’s continued attack led them to be vulnerable at the back, which was exploited when Peter Cech launched a long ball towards Didier Drogba. As the ball was coming in to Drogba, Victor Valdes charged out of his goal and collided with his defender Gerard Pique and Drogba, knocking the Barcelona player out cold for a short period. Pique made a miraculous recovery, but still looked shaky in his return to the pitch. Barcelona did not sit back and wait for their defender to recover, but continued playing their trademark style, which almost yielded the opener when Cesc Fabregas found Lionel Messi with a backheel pass. Messi tried to make the most of his chance, but Peter Cech saved with his feet and the ball was cleared from danger. Javier Mascherano had an opportunity from distance a few minutes later, but it did not trouble Peter Cech. Chelsea had another opportunity again thanks to a Cech long ball that found Didier Drogba. Drogba bullied his way past the woozy Pique and had an opportunity from a very sharp angle, but the ball only found side netting. Just after this incident, Barcelona made an substitution of their own, replacing the injured Pique with Dani Alves. Their tactics changed along with this, now changing to a 3-4-3 with Mascherano. Over the next few minutes approaching the half hour mark, Chelsea looked disciplined in defense, while Barcelona continued their repeated attacks, coming from seemingly every possible angle and option. At some point on early in the match I noticed that the referee was wearing purple, I took this as an ominous sign that the referee would be firmly on Barcelona’s side. The first lapse in Chelsea discipline was by John Obi Mikel, who brought down Alexis Sanchez just outside the penalty area. A minute later, Peter Cech was given his first warning for time wasting, thanks to the derision being showered on him by the Camp Nou. On the following run of play, Barcelona struck for the first time. Dani Alves pounced on a loose ball and moved it to Isaac Cuenca who slotted it across the box to the wide open Sergio Busquets. Busquets made no mistake with the easy finish and just like that Barcelona had the upper hand with Busquets’ first goal of the season. It seemed inevitable that Barcelona would score, but nobody expected it to come from Busquets. Matters would only grow worse for Chelsea over the next several minutes. In an attempt to introduce a more intimidation into the Chelsea defense, John Terry hit Alexis Sanchez with a raised knee to the buttocks. Alexis Sanchez made the most of the incident and fell to the ground, which prompted the linesman to signal the match official, who showed John Terry a red card. Terry was in disbelief that he had been sent off and refused to leave the pitch for a moment, before handing the captain’s armband to Frank Lampard and making his way to the dressing room. It was a truly unfortunate incident for the Chelsea captain, one that showed poor decision making and selfishness in the face of the great adversity Chelsea was facing. John Obi Mikel immediately dropped back into the central defending roll and Didier Drogba joined him for extra insurance as Chelsea braced to hold out for penalties. That strategy was smashed to pieces eight minutes later when Barcelona struck again. Busquets gained possession and moved the ball to Alexis Sanchez who found Messi. Messi took control of the pass and placed a ball on Iniesta’s feet, Iniesta took a touch and then two strides later slotted the finish past Peter Cech and into the goal. This 44th minute dagger meant that Chelsea would have to score with only ten men in order to progress to the final. Just when all hope seemed to be gone from Chelsea, a moment of brilliance restored their faith. Frank Lampard collected the ball in the middle of the pitch and played a perfect through ball for the streaking Ramires. As Ramires entered the penalty area, Victor Valdes came out to challenge, but not before Ramires lobbed a pristine ball over Valdes’ head and into the back of the net. This crucial goal meant that unless Barcelona could score, Chelsea would be through to the final. As the halftime whistle blew, Chelsea marched into the locker room while the Camp Nou buzzed nervously, still stunned at what had just occurred. Immediately after the restart Barcelona was back in Chelsea’s end, enjoying possession and eagerly looking for any opportunity that would give them the goal to put them through. They were rewarded in the 48th minute when Cesc Fabregas went down from a lunging Didier Drogba tackle that made minimal contact, but enough to award the penalty. Lionel Messi strode to the penalty spot, the whole world expecting him to sink this opportunity and send Barcelona through. Before Messi made contact with the ball, Cech flinched to his left, causing the rattled Ballon D’Or winner to send the ball higher than the diving Cech. The ball struck the crossbar and was cleared by an overhead kick by Raul Meireles while Chelsea fans around the world exploded in celebration. Barcelona did not appear to be the least bit discouraged by what had just happened, and their relentless attack resumed moments later. Preferring to work the ball into the box, rather than shooting from distance, Barcelona’s continued efforts inside the box were blocked by defenders, ran wide due to poor shooting, or were stopped by the flailing body parts of Peter Cech. As the seconds passed interminably for Chelsea and their fans, confidence grew within the Blues and their defense remained disciplined. Over the course of the frantic second half, Chelsea had substituted playmaker Juan Mata for Salomon Kalou in the 58th and used their final substitution to bring on the beleaguered Fernando Torres for Didier Drogba in the 80th. Barcelona used their remaining substitutions to replace Isaac Cuenca with Christian Tello in the 67th minute and Seydou Keita for Cesc Fabregas in the 74th. With all substitutions used, the managers were out of options for the final ten minutes. Chelsea chose to sink all nine of their outfield players behind the ball and absorb the onslaught from Barcelona. In the 82nd minute it looked for a moment as if Barcelona had found the goal they sought, but the play had been whistled dead due to Dani Alves being in offside position. As the seconds ticked away Lionel Messi had an opportunity to redeem himself for his earlier penalty miss, his shot was destined for the back of the net, but the outstretched hands of Peter Cech pushed the ball into the goal frame and the clearance earned Chelsea another brief reprieve from the assault. Barcelona’s efforts continued and in the 89th minute another Peter Cech save was forced by Javier Mascherano and the ball went out for a corner. Carles Puyol sent the header off the ensuing corner sailing over the bar. Another Barcelona attack was thwarted by a tackle from Fernando Torres, but he was unable to maintain possession as he dribbled up the field and Barcelona was given another opportunity. Ashley Cole expertly snuffed out the attack and sent a long ball upfield that Torres latched onto alone, in space, with only the keeper to beat. As Torres closed in on goal, he looked like he was shedding all the burdens he had been carrying since joining Chelsea. The big price tag, the scoring drought, the lack of confidence were all left behind him as he rounded Victor Valdes and easily slotted home the finish to a goal that was equal parts vindication and satisfaction. Chelsea fans around the world erupted in applause as Fernando Torres ran to the sideline where he was joined by his teammates in celebration. Chelsea had done the impossible, beaten the best squad in the world coming from 2-0 down to do earn the draw that send them through to the Champions League Final. As the final whistle blew, a tearful Lionel Messi shook hands with the opposition and a dejected Barcelona squad exited the pitch amid Chelsea’s celebrations. Overall, this was one of the best football matches I have ever seen. Chelsea will have a lot of changes to make for the final; they will be missing Terry, Ramires, Raul Meireles, and Ivanovic due to suspensions and possibly Cahill and David Luiz to injuries. Those are issues to be dealt with later for Roberto Di Matteo, for now it is time to celebrate.